Our Family Centers are the core of Child & Family Service, offering a place of refuge for local families and individuals who are experiencing crisis, such as trauma, family violence, poverty or homelessness. Thanks to the generous donations and volunteer support in the community, our Family Centers have been able to address basic needs, such as food, clothing, shelter, to providing parenting classes, job training, and most importantly addressing the underlying social and emotional issues leading families and individuals to the Family Center in the first place. 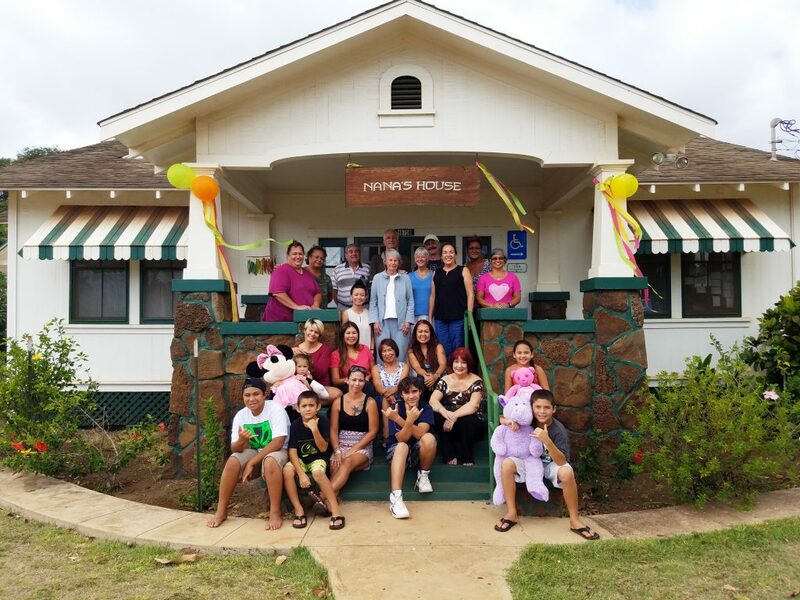 The first CFS Family Center, Nana’s House, opened in Waimea, Kaua‘i in 1996, after receiving a federal grant. Named to convey its welcoming, nurturing atmosphere, Nana’s House became a one-stop shop for at-risk families and children to walk in and receive immediate help without judgement or exclusion. It was also important to build trust with the Waimea residents, who had seen similar programs come and go all too often. “We established an Ohana Advisory Council right away that was made up of community members, to help us determine what services were most needed,” says Bates. Today, Nana’s House is 20 years old and has become an integral part of the neighborhood. In fact, the Ohana Advisory Council still maintains the role of guiding the Center’s focus on the issues and needs facing the community. There are now six Family Centers serving Kaua‘i, O‘ahu, Maui, and Hawai‘i Island. According to Karen Tan, Chief Program Officer, each Family Center offers services tailored towards the local community’s needs. “Many people receive help from our Family Centers, move forward and then become an employee or volunteer for us, so that they can turn around and help others.” says Tan. In the last fiscal year, Family Centers have served more than 1,000 families, whether it’s giving a hungry family nutritious cereal, teaching parents how to resolve conflicts or helping a mother apply for food stamps. These opportunities are only available thanks to your generous support and donations – you help us give families a fresh start. • The Harry and Jeanette Weinberg Foundation, Inc.